How to Setup Professional Email Address with Google Gmail? Having your own brand name and professional email address but not using your branded email for sending emails, newsletters or communicating with your clients is really a foolish mistake that many bloggers often made. I was too 🙁 Sometimes webmasters and bloggers don’t care about this though it’s essential for any business to make it more professional. Are you one of them? Seriously?? Do you have any idea by continuing this B.S approach actually you are ruining your business or blogging journey day by day(especially in business). Personally whenever I see a business which is using a free email address like Gmail, Yahoo mail address instead of their own branded email, just one thing comes in my mind. A business who is using un-branded email as an official contacting source, is they really want to do business or they are really serious about business? actually, they are not. Honestly, how many times you contact a firm/company which is using @gmail or @yahoo.com as their professional email address. So, why you also doing this mistake? You can use your branded mail address with Gmail easily by configuring some easy settings. After configuration, whenever you send an email this will be sent via your brand name like [email protected] instead of Gmail address. Today, in this article I will show you how to set up your professional email address with Google Gmail. 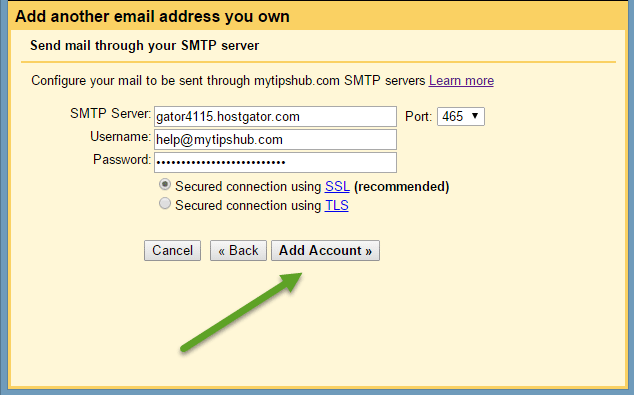 How to Setup a Professional Email Address with Gmail? I hope you already bought a domain and web hosting for your site, if not yet then NameCheap and BlueHost are known as the best in this business. First of all, you must have your branded email address which one you want to configure with Gmail account and Gmail account also. I supposed you already have both requirements. But if you don’t have, learn from this guide. 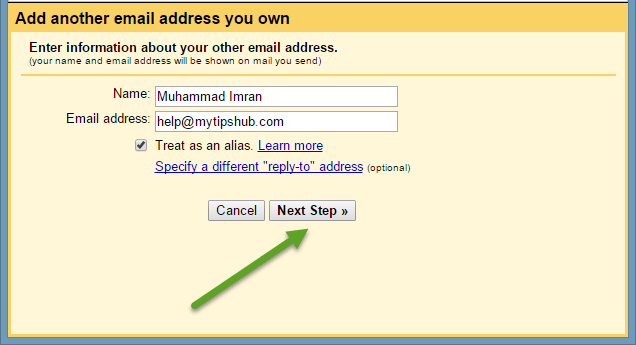 Now after creating mail address, Sign In to your Gmail account. Click on Gear Icon located at the top right side of your browser windows and then Settings. Click on Accounts and Import option and then Add another email address you own, a pop up windows will be open look likes below. Type your preferred name and professional email address and click on Next Step. Here you need to enter your branded email address, password, outgoing server info and port address. You can find all the details by visiting your web hosting Control Panel> Email Accounts. Click on More button for the specific email address which you want to configure with Gmail and then Configure Email Client. You will find your email manual settings like below one. After setting up all required settings, Gmail support send you an email with a verification code. Sign in your brand email address via your web hosting cPanel> WebMail to get verification code and just enter that code and click on Verify button. Pop up windows will be closed automatically. At the end just make your branded domain email address default for sending emails. Now you just need to setup a mail forwarder to receive all emails in your Gmail account that users/clients will send on your professional email address. To achieve this go to your hosting control panel on the home screen, you will see a section named “Mail” within this section click on Forwarders>Add Forwarder and point your branded email toward Gmail address. Now when anyone will send an email, it will be redirected to your Gmail id. And that’s it, you have just configured your professional email address for sending emails via Gmail account. I hope this article will help you to setup your branded email address with Google Gmail account easily without any hurdles. But if you need any help feel free to ask in the comments section.